It’s odd how, at times, my readings appear to converge or echo each other quite unconsciously. From two entirely different directions I determined to reread my collection of Emma Goldman’s writings and Christa Wolf’s Medea. And yet I found striking parallels between Goldman and Medea. Both women flee their homelands (Tsarist Russia and Colchis, respectively) when young, disillusioned with their countries. Both travel to an idealized land that promises a better life (America, ancient Greece). And both hook up with men who prove unreliable (Alexander Berkman, Jason). But aside from these rather superficial correspondences, the vital parallel is that both women fight to live in a world where they can freely express their individuality; and beyond that for a world where everyone can have the same opportunity. It can be disheartening to see how little progress we’ve made in the 72 years since Goldman died. Indeed, I could suggest that we’re rapidly becoming more and more like the societies both women fought against, making this book (and Emma Goldman) all the more relevant. Aeson, king of Iolcus in Thessaly, had his throne usurped by this half brother Pelias. Aeson’s son Jason was saved, and sent away to be educated by the centaur Cheiron. Grown to manhood, he arrived at the court of Pelias to claim his birthright, but Pelias said he would surrender the throne only on condition that Jason bring back the Golden Fleece from Colchis – a demand which was thought to be the equivalent of a death sentence, as Colchis, situated at the extreme end of the Black Sea, was thought to be unreachable…. Jason had either to refuse the quest and give up all hope of the throne, or accept it and endanger his life. He chose the latter course, and summoned fifty heroes from all over Greece to his aid. These were the Argonauts – named after their ship – who after many perils and adventures arrived at last at Colchis…. There Jason demanded the Golden Fleece as his by inheritance. Aeëtes, King of Colchis, set more impossible conditions…. Jason was ready to admit defeat when he was seen by Princess Medea, daughter of Aeëtes, granddaughter of Helius the sun god, priestess of the Triple Goddess of the Underworld, and a powerful sorceress…. Overcome by her love for Jason, she used her occult knowledge to help him surmount the various obstacles and to obtain the Fleece, in return for which Jason swore by all the gods to remain true to her forever. Together with the Argonauts, the two lovers set sail by night; but once the alarm was raised, King Aeëtes and the Colchians followed them…. Some say Jason killed Medea’s younger brother Apsyrtus… others, that Medea herself murdered the boy, dismembered him, and scattered the pieces in the ocean…. After several more escapades… the two, now lawfully man and wife, were welcomed at Corinth by its King, Creon…. Jason, forgetting both his debt of gratitude and his vows to all the gods, forsook his loyalty to Medea. Some say he was swayed by the insinuations of Creon… others, that he was overcome by a new love; others, that he was impelled by ambition; but in any case he decided to repudiate Medea, and marry Creon’s daughter Glauce, thus becoming the heir to Corinth. 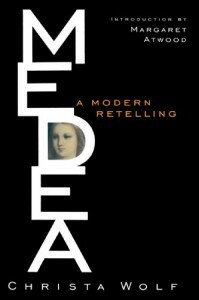 Medea herself was to be banished from the city. As Atwood alludes and as one can read in Robert Graves’ The Greek Myths, there are many variations to the story. It was ancient when Homer composed The Iliad and its most ancient layers hearken back to a pre-Greek era when the Goddess in her many guises was the supreme deity and women more than the chattel of their male relations. It’s this most archaic stratum that Wolf mines to present her version of the myth. While it can be read as a strictly feminist tract, it shouldn’t be. It’s issues are far broader than a discussion of women’s place in society. It’s a critique of modern, capitalist (and, yes, male-dominated) culture, and – on a personal and the more important level – it’s an argument for the importance of retaining one’s integrity as a person in the face of enormous pressure to conform and submit. And that’s why I’ve revised my rating to four stars – it spoke to me more powerfully now than it did 15 years ago when I was – unfortunately – a less discerning reader. Wolf picks up the tale toward the end of Medea’s exile in Corinth. She and Jason are estranged, and she has long since lost any illusions she may have had about the nature of her erstwhile lover’s homeland: It is as corrupt and oppressive as Colchis was becoming under her father’s faltering grip. The story is told in six “voices”: Medea’s, of course but also Jason’s; Glauce’s; Agameda’s, a Colchian exile; Akamas’, Creon’s first astronomer; and Leukon’s, the city’s second astronomer. And she combines a colossal ego (p. 59) with low self-esteem (p. 58). If Agameda symbolizes anything in this myth, it’s the person who submits to oppression, then manipulates the system to feather her own nest, deluding herself that she has power over her destiny and others. What man, even if he’s her father, would want to touch a girl’s pallid unclean skin, her thin lank hair, her awkward limbs, even if she’s his daughter, isn’t it so, yes, the first thing I knew for certain was that I’m ugly; the woman whose name I don’t want to say anymore can laugh at me as much as she wants, she can teach me tricks, how I should carry myself, how I should wash and wear my hair, naturally I was taken in by all that, and I would almost have believed her, would almost have felt like any other girl; that’s my weakness, believing those who flatter me, though it wasn’t actually flattery, it was something else, something cleverer, it went deeper, it touched the most secret spot inside me, the deepest pain, which up until then I was able to display only to the god and will be able to display only to the god again from now on, forever and ever, that’s my sentence, I dare not think about it, it makes me sick, she taught me that, it makes me sick when I keep recalling to my mind those images of myself as an unlucky person, as a poor soul, but why, she said, laughing as only she can laugh…why, she said, do you want to suffocate your whole life under all this black cloth, she took off the black clothing I’ve worn as long as I can think…. She sewed the clothes for me…I ran through the halls with downcast eyes, one of the young cooks didn’t recognize me and he whistled at me after I passed, unheard-of, unheard-of and wonderful, oh how wonderful, but her black magic was just that, she let me feel something that wasn’t real, isn’t real, all of a sudden my arms and legs became graceful, or anyway that’s how it felt, but that was all deception, ridicule…and proof of all this is that now, when they’ve taken me away from her corrupting influence and given me back the dark-colored clothes I belong in, that now my arms and my legs, too, have lost their deceitful gracefulness again and no apprentice cook, no matter how stupid, is even going to think about whistling at me…. Glauce’s voice is particularly difficult to listen to. Wolf manages to pull off making her characters both mythic symbols and real people, and nowhere better than with this 13-year-old girl whose life is destroyed by her father’s ambitions. AKAMAS: Akamas is the villain of the piece. Unlike Agameda, he actually does wield power over the lives of others. And he convinces himself that everything he does – the lives he destroys – is all for the good of Corinth. Echoing Jason, “we must do quite a few things that give us little pleasure” (p. 90) and “of course, the price one might be called upon to pay for this could be very painful.” (p. 95) But Wolf uses that echo of Jason’s complaint to illustrate how, ultimately, Akamas is as powerless as the Argonaut. While he admires Medea, Akamas has no qualms in abetting the schemes of Agameda and her other enemies among the Colchians or fanning the fears of the Corinthians. It removes a disruptive influence from the politics of Corinth. Then again the woman, the one who came up to us in Aeëtes’s vine-covered court, was the opposite of the horrible corpse-fruit, or maybe it heightened the impression she made on us. The way she stood there, stooped over, in that red and white tiered skirt and close-fitting black top they all wear, and caught the water from the spout in her cupped hands and drank. The way she straightened up and notice us, shook her hands dry, and approached us frankly, taking quick, strong steps, slender, but with a well-developed figure, and showing off all the virtues of her appearance to such advantage…. I see plainly what will happen to her. I shall have to stand by and watch the whole thing. That is my lot, to have to stand by and watch everything, to see through everything, and to be able to do nothing, as though I had no hands. Whoever uses his hands must dip them in blood, whether he wants to or not. I do not want to have blood on my hands. I want to stand up here on the roof terrace of my tower, observing the milling throngs below me in the narrow streets of Corinth by day and bathing my eyes in the darkness of the heavens above me by night, while one by one the constellations emerge like familiar friends…. I would also recommend John Gardner’s Jason and Medeia, a poetic retelling of the myth, which ranks up there with this version as one of my favorites.